CryoDax Low Temperature Liquid Chiller Systems - Mydax Inc.
With over three decades of experience and refinement of low temperature liquid chiller / heater systems, Mydax has designed the CryoDax series of chillers to provide Quality, Reliability and Performance for demanding industrial temperature control applications. 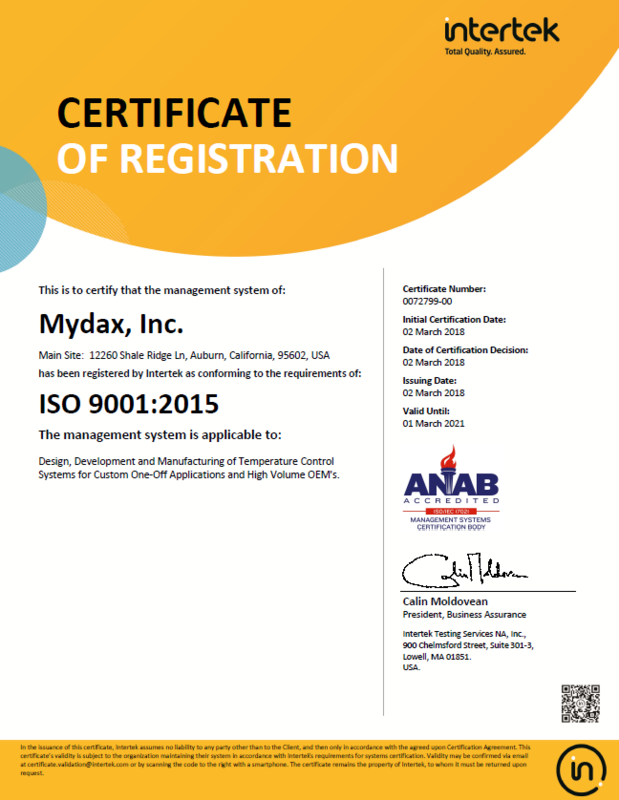 With a temperature range of -70°C to +80°C standard (-70°C to +150°C available) and large cooling capacities at low temperatures, CryoDax chiller systems offer industrial temperature control solutions for Hydrogen Fueling, Semiconductor, Pharmaceutical, Automotive, Aerospace, Medical, Extraction and Custom applications. CryoDax Low Temperature Chiller systems are an excellent choice for Extraction Chiller Applications that require high cooling capacity at low temperatures. Our CryoDax H2 systems are designed specifically for Hydrogen refueling precooler applications. Like all Mydax chiller systems, our CryoDax low temperature liquid chiller systems utilize our Advanced Temperature Control Technology 0 to 100% proportional cooling and heating control, rugged tubular steel frames and touchscreen controls along with leak free pumps, process fluid flowmeters, stainless steel brazed plate heat exchangers and all brazed copper piping. Each system undergoes rigorous quality assurance testing with system documentation and performance graphs provided. CryoDax systems include UL-508A Industrial Control panels and are ETL listed. Wide Chiller temperature range available: -70°C to +150°C with a single fluid and recirculation loop! Extended temperature ranges available. Capable of the largest cooling power available at temperatures below -40°C; unmatched in the industry! Excellent choice for H2 Hydrogen Cooling / Chilling Refueling applications! Industrial cooling capabilities for cannabis extraction and other applications where reliability is paramount! Precision temperature stability and very cold near cryogenic temperatures! Modular designs available for easy additon of more total system cooling power! 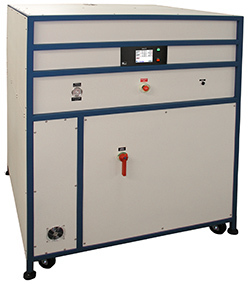 Multiple compressor systems available for more low temperature cooling power! Reliable design with over 20 years product experience! Please Note: These systems can be customized to meet your specific needs. Temperature Stability ± 1.0°C (standard), ± 0.5°C or better avail. Standard Items: Powder coated Heavy-Duty welded tubular steel frame with aluminum panels; Portable chiller system on locking casters with leveling feet; Opdax color touch-screen controller; Stainless Steel brazed-plate heat exchangers; Stainless Steel Mag-drive Seal-Less pump, Stainless Steel turbine flowmeter on Heat Transfer Fluid (HTF) return path; Strong all brazed refrigeration and HTF copper piping; High Reliability, Patented Proportional Control Refrigeration Technology; RS-232 Serial communication interface; 12 Month warranty with free telephone and online support. Optional Items: Extended temperature ranges; Fluid filtration; Increased reservoir volume size; Sealed reservoir which includes provisions for a Nitrogen blanket on the fluid, pressure regulator and safety pressure relief valve; Variable Frequency Drive (VFD) to precisely meter the output HTF fluid flow; Increased pump size – HTF output flow / pressure; Increased heating capacity; Rotary flowmeter on facilities water return path; Stainless steel or other material HTF piping; Air cooled refrigeration condenser (up to +32°C/90°F ambient); Sound Insulation; Digital HTF Pressure Gauge(s); Modbus, GPIB (IEEE-488), RS-485, Ethernet LAN and Analog Input/Output; Special voltages and/or 50 Hz operation; Custom system design, frame size and form factor; Custom system powder coat colors; Outdoor rated system; Extended or onsite warranty; Remote temperature sensing and control; Custom software; UL or CE certification.